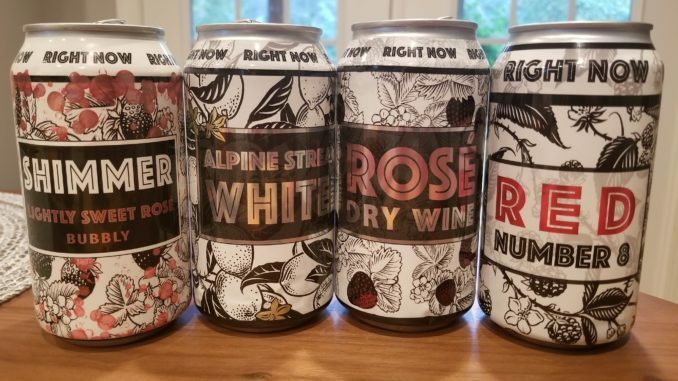 I’d thought about doing a post for each, but I think it makes more sense to talk about all of these together, especially so I don’t have to keep having the same conversation about my thoughts on canned/non-traditional wine packaging in general. Alright…here goes. I really like the current trends towards non-traditional ways of packaging and presenting wines. It all started years ago with one my favorite Virginia vineyards, Blenheim, going all-in with screwcaps. At the time, it wasn’t something you saw on quality wines, but I love the approach, making it easier to get into the wines, ensuring that the wines aren’t tainted by cork, and helping out the environment by not having to cut down trees just to make an enclosure. This carried forward to my love of boxed wine (or bag in a box as I see some places are trying to brand it). Again, you saved on packaging, allowing you to get more bang for your buck, and I’ve had some really good wines without ever having to open a bottle. In the last few years I’ve started seeing wines packaged in cans. The obvious appeal to this is that since the packaging isn’t breakable, it’s ideal for taking to the beach/pool/on a boat where glass is a big no-no, and unlike boxed wine, you don’t need a glass to drink the wine – just sip it straight from the can. On top of that, they’re great for when you just want a little more wine, since one 12 oz can is two perfect glasses of wine (assuming you actually do a 6 oz pour like you’re supposed to). All of which leads us to Right Now Wines. I recently received a 4-pack of their wines, and last weekend, my wife and I cracked them open and gave them a try. There were some surprises, some expectations were met, and really only one disappointment. We started with the Right Now Shimmer, a “lightly sweet rose’ bubbly” according to the can. The wine was a deep pink color that bordered on the red. Nothing in the notes or the website for Right Now Wine told me what grapes were used, but if I had to guess, I would think Chambourcin was there, since I’ve seen rose’ that color made using that grape before. I didn’t get much on the nose, but in the mouth I picked up strawberry and candied cherry. The sparkle on the wine was subtle, with small bubbles and just enough effervescence to qualify as “bubbly”. The wine had a slight sweetness to it, but not enough to make the wine cloying. This would be great for a hot day at the beach, or as an aperitif with some strong cheeses. We followed up the sparkling rose’ with the dry rose’. It seemed appropriate. The dry rose’ was lighter in color than the Shimmer. On the nose I picked up a slightly yeasty aroma, while on the palate the wine showed tart strawberry. Crisp and refreshing, this would be perfect poolside on a hot day, or paired with chicken or fish or creamy cheeses. Of the two rose’s, this was our favorite, and one I would certainly buy again. I’ll go ahead and get it out of the way – of the four wines, this was our last favorite. Light yellow in color, I didn’t really pick up anything on the nose. In the mouth the wine was pithy, with green apple flavors. It had a touch of body to it, but I don’t think it was from spending time in oak. If I had to guess on the grapes, I would guess Pinot Grigio or Chardonnay, or likely a blend of the two. I like the idea of a white in a can, but I think a Sauvignon Blanc would work better; something crisp and refreshing. The final wine we opened was Red Number 8. The wine was a dark purplish-red color, and on the nose I picked up notes of dark fruit, cherry, and blackberry. In the mouth the wine showed dark fruit with some jamminess without being too fruit forward, thanks in part to a nice tart, clean finish. Of the four wines, this was our run away favorite, and it’s definitely one I would buy again. Alright, so what was my overall impression of Right Now Wines? I liked them. Of the 4, there’s only one I wouldn’t really want to drink again (Alpine Stream White), and one that I would absolutely pick up again if I saw it in the store (Red Number 8). I appreciate the packaging, and I think the pricing is fair – their website lists them at $24 for a 4-pack.